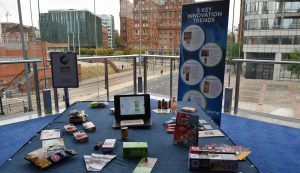 MANCHESTER – 31st October 2018: Dozens of leading professionals descended on the Bridgewater Hall last Thursday (25th October) as the 2018 edition of the Gama Innovation Conference & Awards further cemented Manchester’s place as the new hub for fast moving consumer goods (FMCG) innovation in the UK’s Northern Powerhouse. 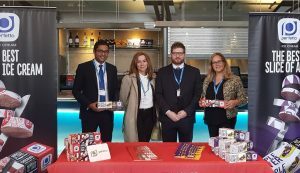 Attendees from as far afield as Australia, Canada, Brazil, United States, France and the United Arab Emirates ensured the third gathering of the FMCG community in the heart of Manchester was once again a truly global affair. The informal setting and invitation-only nature of the event, bringing together both established brands, leading retailers and innovative startups, ensured a wealth of opportunities for forging new contacts and exploring new business partnerships. Guests commented favourably on the “high level” nature of the event and the meaningful opportunities it generated. Meanwhile, 20 companies large and small set up stall to showcase brand lines ranging from South Asian inspired gin to high welfare eggs, cricket-infused fruit juice to ‘easy-slice’ ice cream, as the Innovation Zone returned to highlight the latest groundbreaking consumer goods launches hitting shelves around the world. The focus for the morning was the Gama Innovation Conference, which welcomed a diverse line up of industry thought leaders to share their insights on the nature of successful innovation, the key issues affecting consumer goods companies, and the emerging trends, opportunities and threats set to shape the future of the sector. Hot topics such as the pressing issue of plastic waste, the rapid rise of vegan-friendly products and the opportunities presented by customisation and new technology were recurrent themes, with guests praising the “great speakers” and the “really interesting” subjects they presented on throughout the conference. Ian Wright CBE, Chief Executive of the Food and Drink Federation, began by examining the key issues set to affect UK manufacturers and retailers in the year ahead, including the changing retail landscape, the squeeze on profit margins and the growing clamour for action on single use plastics. Paul Brown, Founder & CEO at BOL Foods, shared his journey to creating a successful retail brand, emphasising the importance of setting a clear purpose, aiming high, being persistent and learning from mistakes. Hugh Taylor, Head of Research & Development at Calbee UK, explored how ‘better for you’ trends are driving the evolution of the snacks category, with consumers seeking products satisfying a demand for both health and indulgence. Melissa Snover, Head Magician at Katjes Magic Candy Factory, revealed how 3D printing could be set to shape the future of consumer goods manufacturing in the confectionery space and beyond, opening up new opportunities in customisation and personalisation. Tom Warden, Editorial Director at Gama, ran through five key trends shaping consumer goods innovation, ranging from the growing influence of vegetable ingredients to the way companies are responding to the debate on sugar levels in food and drink products. Kevin Verbruggen, Head of Brand at Weetabix, discussed how to turn trends into profitable success, emphasising the importance of establishing a point of difference and understanding how to “break rules” to positive effect. Mike Blake-Crawford, Strategy Director at Social Chain, rounded off the session by sharing key lessons in social media strategy, exploring how FMCG brands can best use digital media to engage meaningfully with consumers. The afternoon saw the spotlight switch to groundbreaking innovation in global consumer goods, as the winners were unveiled in each category of the Gama Innovation Awards. The Gama Innovation Awards – presented in the categories of Product, Packaging, Positioning, Branding & Design, Health & Wellness, SME, Best of Britain and Best of Middle East – highlight the very best innovations unearthed in the last year by Gama’s global network of in-country researchers and analysts. 2018 winners were chosen through an international panel of prestigious judges from some of the biggest names in the industry, including Unilever, Kraft Heinz and PepsiCo. Product: Cuisine Soleil Grilled Lentil Snack (Canada). Cuisine Soleil was recognised for bringing something new and distinctive to the savoury snack market using on-trend pulses as the base ingredient. Packaging: Tetra Pak 100 Ultra Mim Aseptic Pouch (UK). The new pack format found favour with judges for the way it enabled juice and dairy firms to expand into ice cream with minimal packaging investment. Positioning: Continente Chutney (Portugal). The award went to Sonae for using leftover fruit and vegetable ingredients to make a line of chutney, invoking circular economy principles. Branding & Design: Rocket Broth Liquid Stock (USA). Rocket Broth impressed the judges with its bold and highly visual design that pitched liquid stock to a younger audience. SME: Fitalety Fit Espresso Coffee Capsules (France). 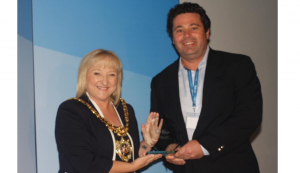 The SME accolade went to Fitalety for providing a new functional option in the coffee capsules category. Health & Wellness: Lotatoes Low Carb Potatoes (New Zealand). T&G Global were recognised for their novel cross-breeding technology that resulted in a potato with 40% lower carbohydrates. Best of Britain: No Dough Pizza Co Cauliflower Base Pizza (UK). No Dough Pizza Co won the judges over with its lower-carbohydrate offering for the frozen pizza category. Best of Middle East: Al Ain Plus Vitamin D Water (UAE). New for 2018, the Best of Middle East award when to Agthia for its new enhanced water seeking to address the issue of vitamin D deficiency. 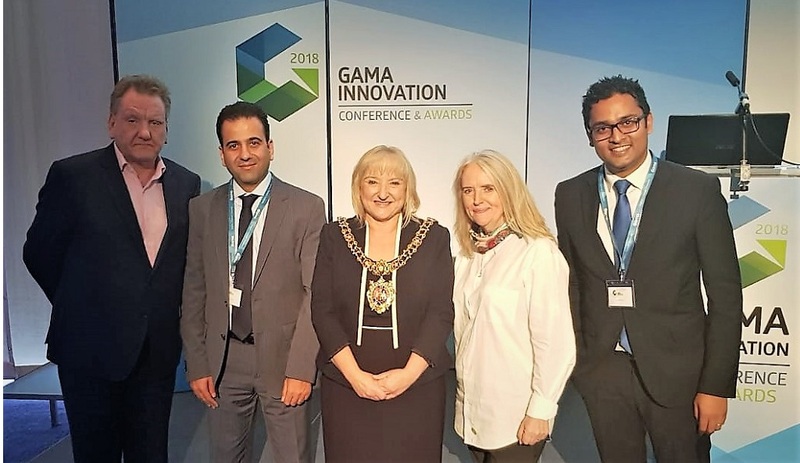 The Gama Innovation Awards was closed by the Lord Mayor of the City of Manchester, who explored Manchester’s reputation as a city built on innovation. 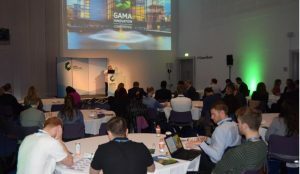 The Gama Innovation Conference & Awards will return to Manchester in October 2019.